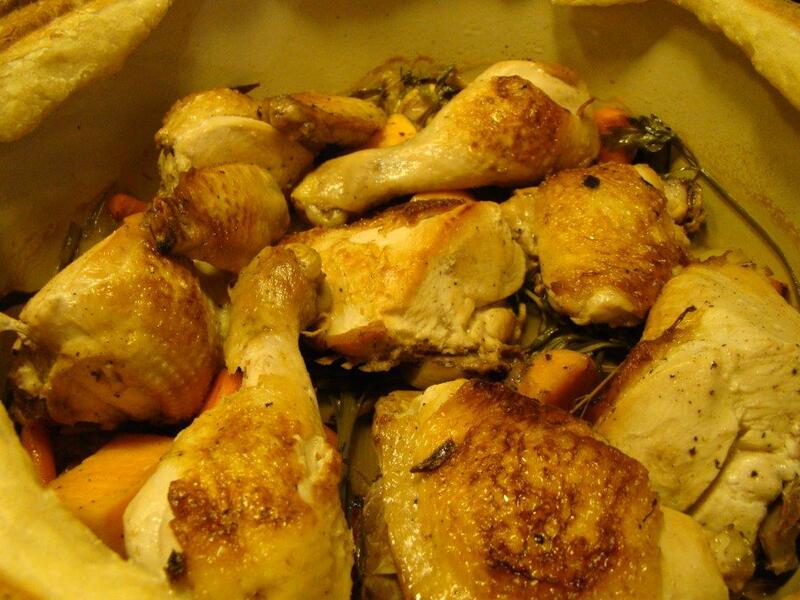 Roast chicken is always a winner in my book. It’s only downside is that in most recipes the chicken takes over an hour to cook, not quite a weeknight dinner. 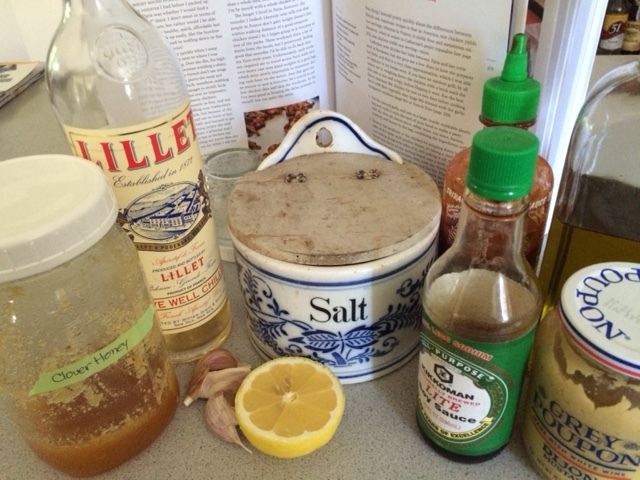 This week’s recipe for Cook the Book Fridays, Chicken Lady Chicken from David Lebovitz’s My Paris Kitchen, solves that problem. The trick? Spatchcocking! What’s that? Spatchcocking? you say. 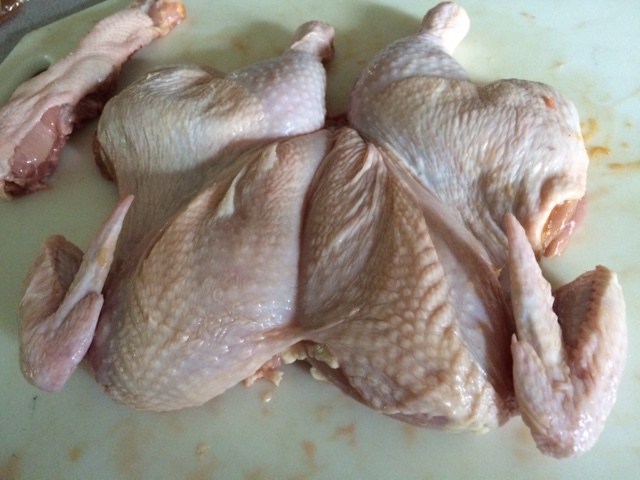 It’s simply a whole chicken with the backbone removed and flattened out. Not nearly as complicated as its name. When the chicken is flat, it cooks much faster. Just 45 minutes. The only advanced planning is preparing the marinade and letting it sit for a day or two. The marinade is quick to mix up. 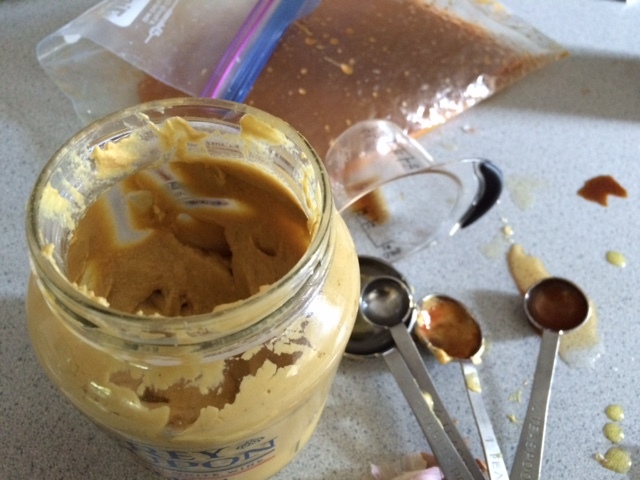 A garlic paste is dissolved into garlic, white wine, soy sauce, olive oil, lemon juice, Sriracha, mustard, and honey in a Ziploc bag. It smells wonderful! Pop the chicken in the bag and rub the marinade all over the bird. Roasting a flat chicken takes less time than a whole bird. 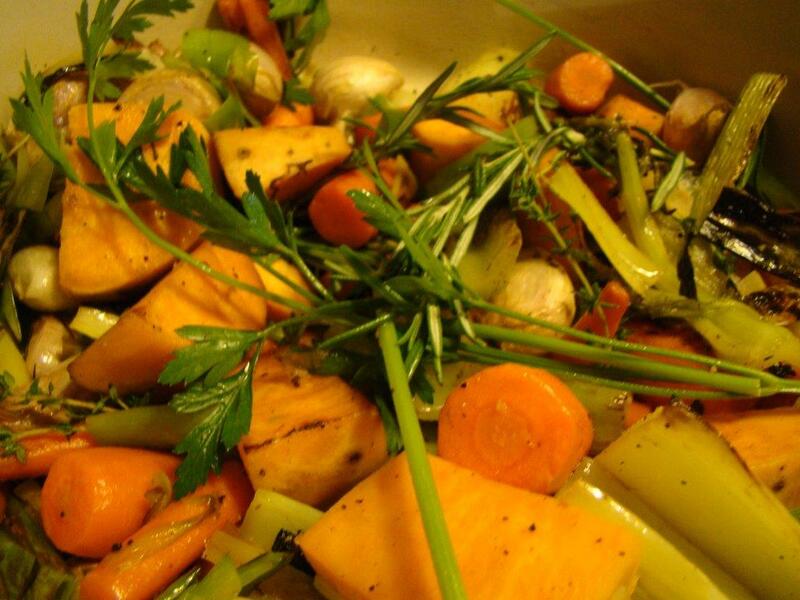 It gets a head start with a stovetop sear to burnish the skin then finishes in a hot oven. My chicken didn’t come out quite as well I as I hoped, but I blame it on the cook (that’s me) falling down on the job. 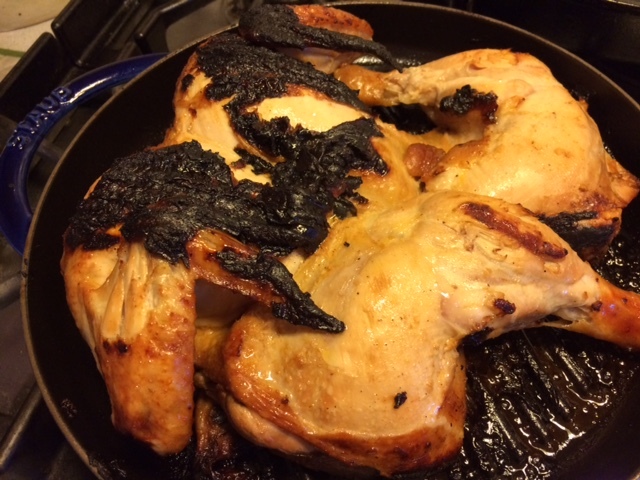 The first problem was that when I seared the chicken in my new cast-iron grill pan, the skin stuck to the pan and burned. In an essay in My Paris Kitchen, David Lebovitz raves about the skin, but my chicken didn’t have that much left after flipping it over. My second problem was that I overcooked the chicken. My chicken was a little bigger than the recipe called for and was cold from the fridge when I started cooking it. I roasted it for the 25 minutes called for without checking the temperature at all as I assumed it would take a bit longer. When I did take its temperature when it came out, it was 20+ degrees higher than it needed to be. No wonder it was dry. The taste of the marinade lives up to its aroma, so I do plan to give this another try, using a regular cast-iron skillet without ridges and testing the chicken’s temperature partway through its time in the oven. 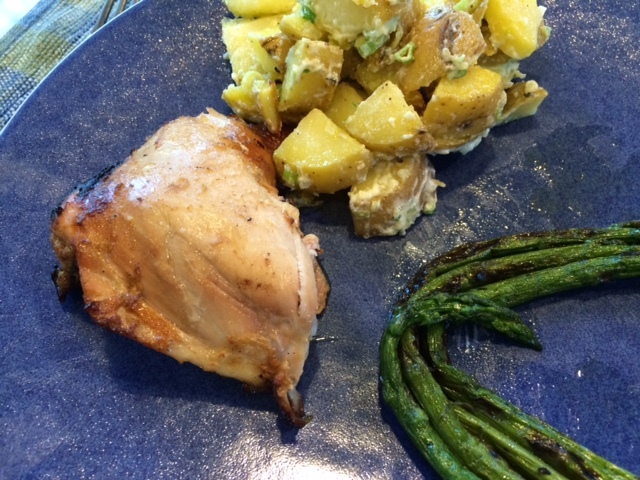 I served the chicken with roasted potato salad and grilled asparagus. Leftovers made a delicious chicken salad too. To see if my “Cook the Book Fridays” friends had better luck with their chicken, check out their posts here. To try it yourself, you can find the recipe on Serious Eats or on page 173 of David Lebovitz’s My Paris Kitchen. 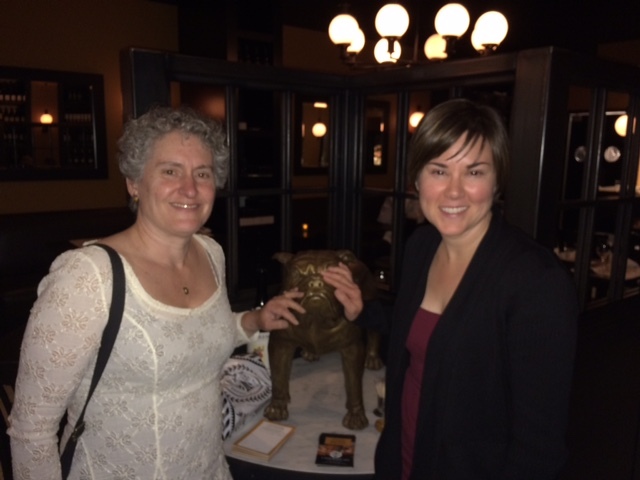 Since our last post for Cook the Book Fridays, I had the pleasure of sharing dinner with Katie of Prof Who Cooks while she was on the East Coast last week. As with so many Dorista meet-ups, even though it was our first meeting, we met as old friends and talked (and ate) the night away. How did we get here? 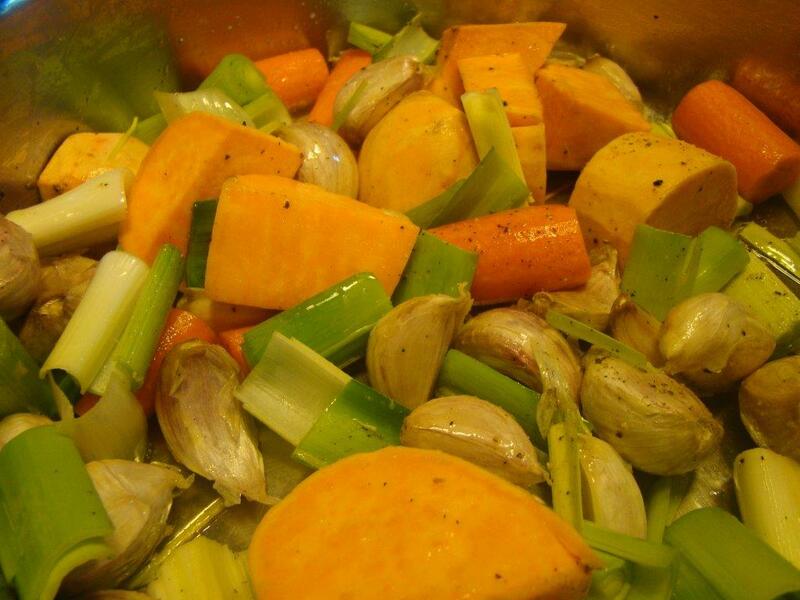 In October 2010, I joined a new cooking group, French Fridays with Dorie, a group taking up the challenge of cooking their way through Dorie Greenspan’s book Around My French Table. Each week, each member of the group cooked the same recipe and wrote about it on their blog on Friday. Week by week by week, here we are over four and a half years later cooking and sharing our last recipe from the book. 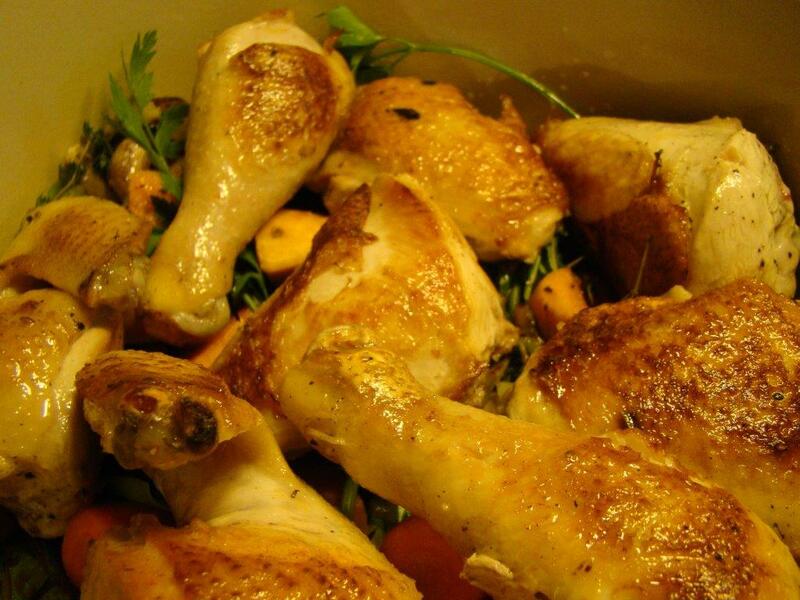 We saved the cover recipe, Chicken in a Pot (the Lemon and Garlic version) to mark the milestone. Looking at the cover photo week after week, year after year, the whole chicken with its burnished skin lying on a bed of vegetables, I always assumed chicken in the pot was a variation on roast chicken. Appearances can be deceiving. On reading the recipe, it turns out this is actually more of a braise. Either way it was delicious. Then, you brown the chicken. I had thawed a whole chicken from the freezer in anticipation of making this version of a “roast” chicken, but when I realized my error, I ended up cutting it into pieces before browning. Much easier to manage on the stove and then the plate. (And there’s the added bonus of sautéed giblets for the dog.) The chicken pieces are nestled on top of the bed of vegetables. A bit of liquid is poured over the top. I was out of chicken stock, so just used water instead, plus some white wine and olive oil. Now comes the fun part! You make a simple flour and water dough, sort of like a soft Play-Doh, just like when we were in preschool, and roll it into a long sausage shape. 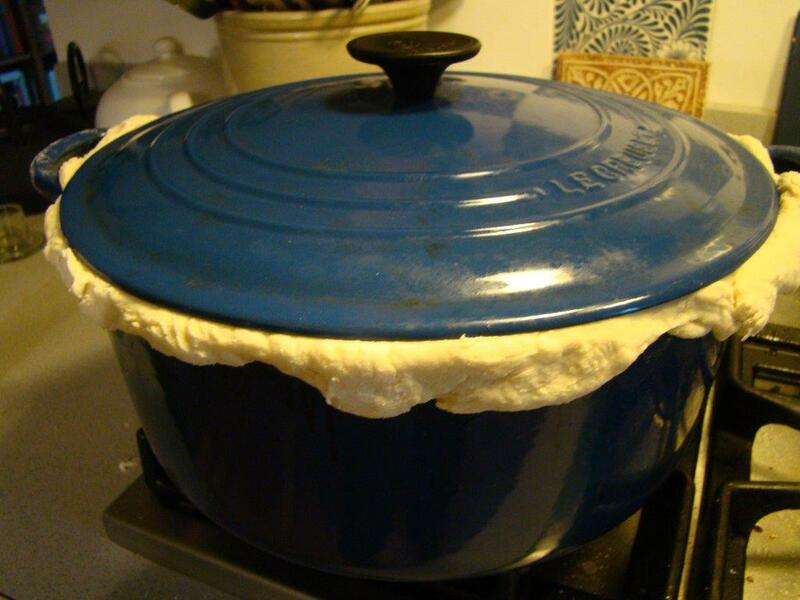 The dough is pressed along the edge of the Dutch oven, and then the lid goes on top. 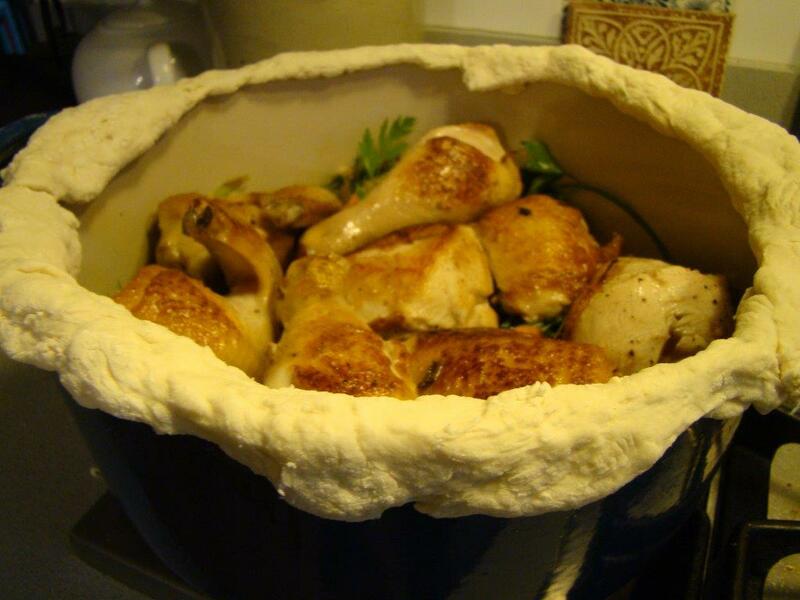 The dough closes the gap between the pot and its lid, sealing in all the moisture as the chicken in the pot cooks in the oven for almost an hour. I never tried this dough technique before, but it was definitely fun. The best part was popping it open with a screwdriver when dinner was ready! I really enjoyed this recipe. The chicken remained moist. I had perched the chicken on top of the veggies, so the skin, while not crisp, wasn’t as soggy as it can get in a braise. The very best part was the sauce. While baking, the liquid in the pot created the most delicious gravy. I had to resist eating it all with a spoon. The chicken was good the first night and then afterwards as leftovers. It’s even company worthy. How perfect to finish up with a winner! We aren’t quite done with this book. There are a few recap posts coming up over the next few weeks. I’ll wait until the “AMFT Grand Finale” to share my reflections as I look back on this unexpected journey. I might even try to fit in a few makeups for the handful of recipes I didn’t get around to. For now, I will say that I joined the group for the personal challenge of actually trying every recipe in a book I owned. I was surprised to become part a community that I suspect will outlive the project we’ve just completed. The FFWD community has touched my life in ways I never could have anticipated with a wealth of learning experiences in the kitchen and out plus the added bonus of real-life friendships with people around the world who I would never otherwise have met. I am so proud of what we collectively created. As a side note, on a solo road trip from Boston to Philadelphia and back this weekend, I was thrilled to share dinner with Tricia and Nana and lunch with Diane. I’m just sorry that, in the excitement, we forgot to take any pictures of us together. Check out my Dorista friends’ posts here. If you’ve been tempted to try some of these recipes on your own, you can find them all in Around My French Table.